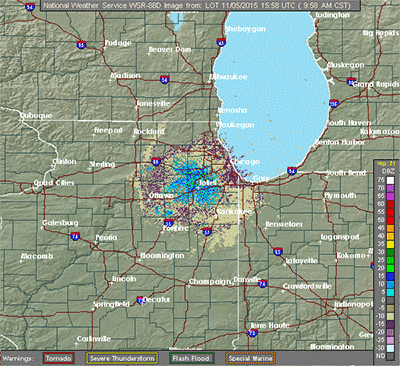 False radar echoes typically seen from ground clutter (blues, greens and purple colors) centered around radars such as this one from the National Weather Service radar in Joliet, IL. There are occasions when it will be difficult to determine if what you see on radar are real echoes. Always get a second opinion for what is displayed by the radar. That second opinion is gained by looking at adjacent radars to determine if they are "seeing" the same thing. False echoes are known as anomalous propagation (AP). It is an echo that is not precipitation. Radar return from AP is unpredictable, often contaminates precipitation measurements and can cause the generation of erroneous rainfall estimates used in hydrology products. There are two main types of anomalous propagation on radars; Ground Clutter and Superrefraction. Ground Clutter is the most common and is usually seen in every radar image. When atmospheric conditions are such where there are low-level inversions (air temperature increasing with height instead of the typical decreasing with height) ground clutter can be very pronounced. Ground clutter is the easiest false echo to recognize since it does not move, it has no kind of structure to it that is similar to real precipitation, and it is usually close to the radar. The ground clutter in clear air mode is often more prevalent than precipitation mode. This is because the radar is in its most sensitive operation thereby "seeing" smaller objects such as dirt, dust and bugs. Superrefraction is where the radar beam is bent greater than normal back toward the earth. If the bending is severe it can actually intersect with the earth's surface. With superrefraction, not only can the radar not see the more distant "real" precipitation, it can also appear the most real. Superrefraction is more likely when a strong low-level inversion is in place, especially when the low-level air is moist and the air above the inversion is very dry. 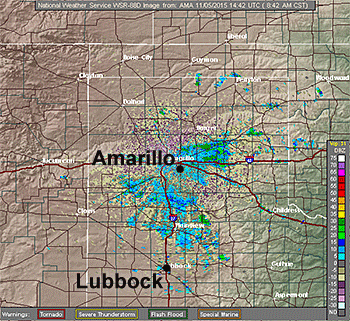 NWS Amarillo Doppler radar image. The image (above) from the NWS Amarillo Doppler radar shows a large number of echoes near the radar with none near Lubbock, TX. NWS Lubbock Doppler radar image. The image (above) from the NWS Lubbock Doppler radar and shows a large number of echoes near the radar with none near Amarillo, TX. In the left image (above) from the NWS Amarillo Doppler radar showing a large number of echoes near the radar with none near Lubbock, TX. 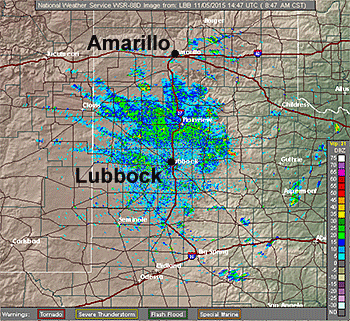 The right image (above) is from the NWS Lubbock radar at the same time. 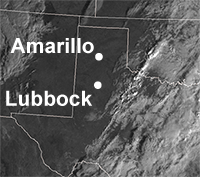 Visible satellite image of the Texas panhandle at the same time the above AP was seen on both radars. Both radars are showing strong anomalous propagation as neither radar supports what the other is seeing. None of the echoes on either radar is precipitation (with the exception of some light precipitation seen on the far right side of the Lubbock radar). This is seeking the second opinion to verify what the radar is indicating is valid, or not. To further verify the anomalous propagation, this visible satellite image taken at the same time as the two radar images below showing clear skies over both radar locations.